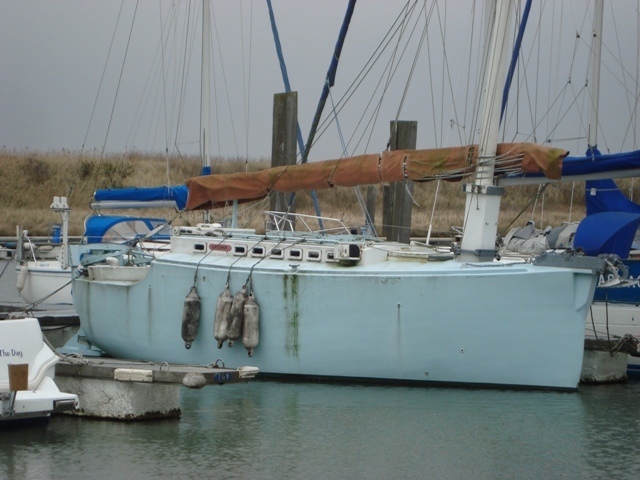 In August, 2010 I featured an unusual junk-rigged yacht at Titchmarsh Marina, Essex. Her name was ‘Skylark’, and she was obviously a one-off. I was vaguely attracted to her, despite certain shortcomings. In December of 2011 I saw her again and she was looking really neglected. I made a tentative enquiry to find out if she was for sale. Initially, the owner could not be contacted, but in February of last year I was told he would accept an offer. I returned to ‘Skylark’ for another look and I was sorely tempted. I thought she would be far more expensive than my budget; nevertheless, I made a ridiculously low offer. Needless to say, it was rejected. Over two months later the owner contacted me and said he would accept my offer!! By then it was too late. The deadline for a project I had intended doing if I had bought her, had passed and I was on a completely different tack. 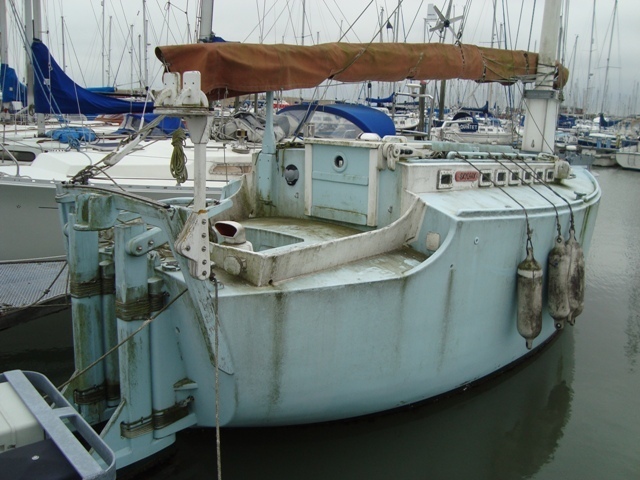 I was looking for a much smaller boat, one that I could keep in my garage - Those who follow this blog will know that I bought ‘Sandpiper’, a ‘C’ Type West Wight Potter. I spent the first half of the summer doing her up. Anyway, I was at Titchmarsh Marina on Monday, and out of curiosity I had another peep at ‘Skylark’. She was even more neglected. 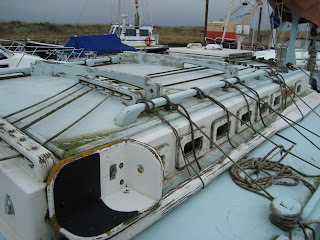 Most of her running rigging had perished and her paintwork was in need of urgent attention. She had a wonderful crop of weeds below the waterline. One thing I will say in her favour is that her interior is first-class, and she has 7 foot headroom. However, I’m relieved I did not buy her because I believe she will not sail well. She has far too much windage and she rolls very easily. I could get her moving like a pendulum by repeatedly pressing the side deck with my fingertips. I do not like her twin rudders. She does not have an engine, which would make manoeuvring in confined spaces difficult. Looks like a bigger Paradox type boat. Yes, Chris, that's the impression, but her underwater lines are very different. 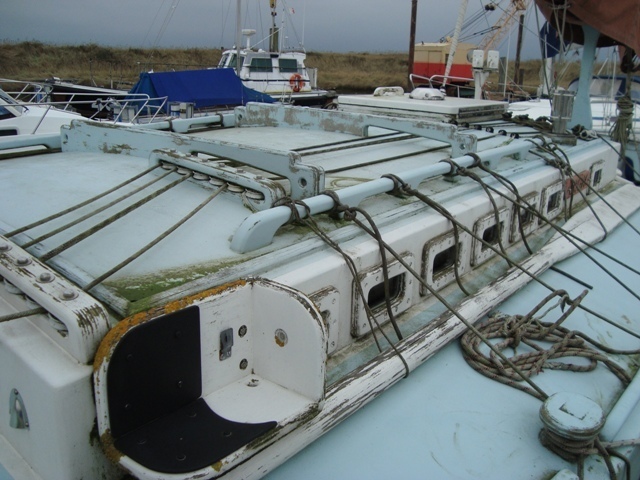 The reason for her high topsides is that the builder took a conventional hull with a long keel and increased the hight of her sides. I think that was the reason for the ease of rolling her by pressing down on her deck with my fingertips. I believe she may be a pig at sea, but I don't really know.